What data are available on private and public health insurance coverage for the population 18 years and over? This section reviews methods to answer that type of question and is focused on Census Bureau statistical programs. See related Web section for more detail. The richness of demographic-economic data tabulated from the decennial censuses has long created a challenge for data users to locate subject matter data of interest; or, is it even tabulated? The addition of the annual American Community Survey has increased data analysis opportunities, but added to the challenge of finding the subject matter items that meet specific application needs. Ultimately, the user has resorted to the difficult-to-use, sometimes even difficult-to-locate, technical documentation. The ensuing challenge is to manually browse through the technical documentation pages to locate the data item and data item name used to access the data. As a part of the Census Bureau API resources, there are now options available to search for subject matter data tabulated from the decennial censuses, American Community Survey and related demographic economic statistical programs. Visit the main page that lists datasets. From that page, individual “dataset item list Web pages” may be opened. Selected, more widely used, dataset item list Web pages are shown below. While these are very useful reference sections as they exist, there remain a few challenges to finding data — specific subject matter. 1) The browser Ctrl-F search tool does not provide multi-word, non-phrase, searches. For example, Age and Asian cannot be be searched in the same query using the browser Ctrl-F.
2) Even when the browser search tool yields successful searches, the list of lines/items shown in the Web page are only highlighted and not reduced in scope. It is very difficult to browse through rows/lines that are not relevant. Click on links below to open dataset item list Web pages. With the ACS, the Census Bureau introduced the margin of error (MOE) estimate associated with every ACS item estimated. Unlike the decennial census item list Web pages, the ACS item list Web page includes a line/item for both the estimate and the margin of error estimate. The estimate item name ends with “E”; the MOE estimate item name is the same item name as for the estimate but ends with “M”. The CV XE GIS dBrowser tool can be used for more advanced data item searching. The following graphic illustrates use of the dBrowse operation being used with the ACS 2012 “dataset item list file”. With Database>dBrowse started, the acs2012.dbf dataset item list file is opened. The query “at(‘M’,item)=0 .and. at(‘private’,itemdesc)>0 .and. at(‘insurance’,itemdesc)>0” is applied to the file. The results of the search are displayed in the graphic. at(‘M’,item)=0 — include only estimate items, the ITEM field must not contain the character M.
at(‘private’,itemdesc)>0 — the case sensitive word ‘private’ must occur in the ITEMDESC field. at(‘insurance’,itemdesc)>0 — the case sensitive word ‘insurance’ must occur in the ITEMDESC field. 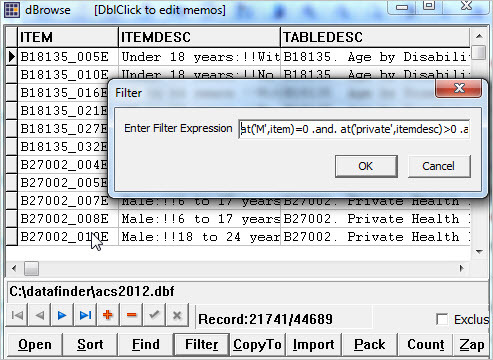 More about structuring a query/search filter: using dbase query/filter expressions. Download the dataset items list files zip file (requires no fee ProximityOne User Group userid). The zip file contains the dataset items list files for the 1990 Census, 2000 Census, 2010 Census and ACS datasets. Each file is structured in the same manner. There are three fields for each record/item line entry. ITEM is the official name of the subject matter item used in a data access operation (e.g., in the DEDE subject matter items list). ITEMDESC is the item description for this specific item in the corresponding table. TABLEDESC is the table description/name that contains the item referenced by the ITEM and ITEMDESC fields. In this version, these three fields have been derived directly from the Census-sourced Web versions. ITEMDESC has been truncated to 100 characters. TABLEDESC has been truncated to 250 characters. There are other ways that searches/filtering can be performing instead of using the AT operation. See using dbase query/filter expressions. The operation “at(‘insurance’,itemdesc)>0” searches the field itemdesc (or ITEMDesc) searches all records for the case-sensitive literal ‘insurance’. Note that the operation “at(‘insuran’,itemdesc)>0” will likely yield the same result. Using the case-sensitive literal ‘Insurance’ will likely yield no or very few matches. The operation “at(‘INSURANCE’,tabledesc)>0” searches the field tabledesc for the case-sensitive literal ‘INSURANCE’. This will technically process correctly. However, since the tabledesc value is the same for all items in that table, more items may be listed than desired. Generally, a query on ITEMDESC is preferred to a query on TABLEDESC. Many spelling abbreviations are used in the Census sourced material; no modifications to the spelling have been made. This may affect search operations. Learn more about using resources described in this section. Join us in a Decision-Making Information Web session. There is no fee for these one-hour Web sessions. Each informal session is focused on a specific topic. The open structure also provides for Q&A and discussion of application issues of interest to participants. We can address your specific questions about finding relevant data and related applications. Semi-transparent layer shows TX22 by county. Overlayed on urban areas — orange fill patern. See details about above map below. Maps of the 113th congressional districts are widely available in many shapes and forms. 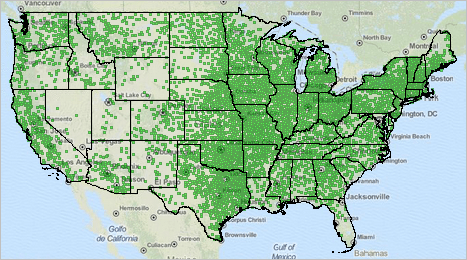 See the CD Gallery to view patterns of economic prosperity by neighborhood for each/every 113th congressional district. Flexibly associating a congressional district boundary with related geography and subject matter requires special tools — as reviewed in this section and available to members of the ProximityOne UserGroup. Creating congressional district maps is often specific to a particular analysis, zoom-view, labeling, combination of different geographies or other considerations. While there are no estimates of unemployment by congressional district, using GIS tools it is possible to view/geospatially analyze patterns of unemployment within a congressional district by county, census tract, block group and other geography. This section reviews tools that you can use to flexibly develop your own maps that show U.S. 113th Congressional Districts of interest using Geographic Information System (GIS) tools. The GIS resources enable you to view/show the congressional district boundaries in context with roads, landmarks and other geography. Flexibly add labels. Create pattern views. Add your own data. Metro maps can be saved as a graphic and used in any manner. There are no fees to use resources described in this section. See additional details about topics covered here in this Web page. GIS resources reviewed in this section enable you to make a map of any congressional district using the U.S. by congressional district shapefile. A second layer shows the U.S. by urban area. By using these layers in combination, you can examine urban/rural patterns by congressional district. A third layer uses the U.S. by congressional district by county shapefile. By using this layer, pattern analysis can focus on a particular part of a congressional district contained within a county as illustrated by a map view below (see #2. 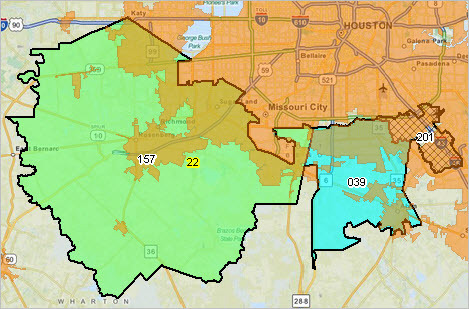 Houston Area; Congressional District by County). The 113th CD urban/rural mapping makes use of the latest latest smoothed boundary shapefiles (July 2014). 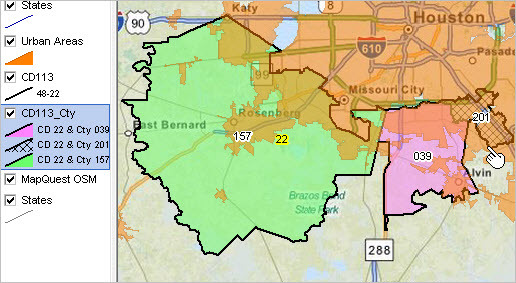 • Congressional districts: black boundaries with CD code/number. • Urban areas: orange fill pattern. 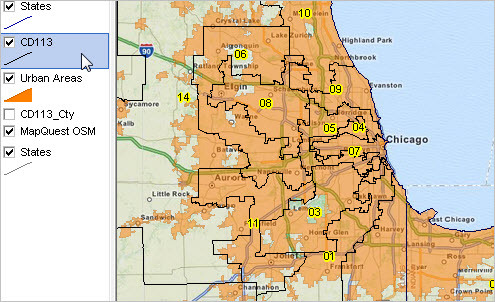 • It is easy to see which congressional districts are 100% urban. 4. Done. The start-up view is shown above with additional instructions. There are three GIS project files included with the ZIP file. Each GIS project (*.gis) includes the same set of layers/shapefiles. 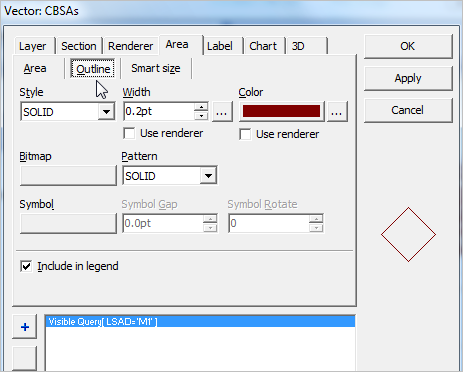 Only attributes of layers set by the CV XE GIS Layer Editor differ. When the c:\cd113_urbanrural\cd113_urbanrural1.gis is opened, the view shown below appears. This project illustrates use of the query “GEOID=’4822′” placed on the CD113 layer displays only the congressional district Texas 22. When the c:\cd113_urbanrural\cd113_urbanrural2.gis is opened, the view shown below appears. This project illustrates use of three queries placed on the CD113 by county layer, resulting in the displays of congressional district Texas 22 by county (three color patterns). When the c:\cd113_urbanrural\cd113_urbanrural_chicago.gis is opened, the view shown below appears. In this project, no queries are placed on any layer. Learn more about using resources described in this section. Join us in a Decision-Making Information Web session. There is no fee for these one-hour Web sessions. Each informal session is focused on a specific topic. The open structure also provides for Q&A and discussion of application issues of interest to participants. 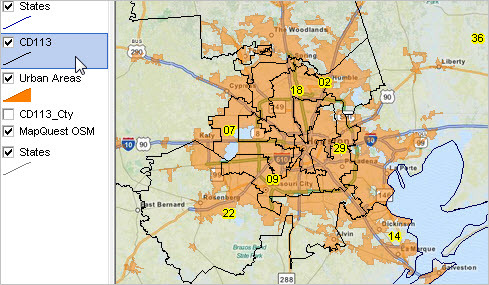 We can address your specific questions about using congressional district and urban area demographic economic data and related applications. There are many data resources to draw upon to analyze detailed industry characteristics and assess how their changing patterns affect regions and the national economy. Among the insights offered by the Census Bureau quinquennial economic census are from data on specific industries; data not otherwise available. The 2012 economic census (EC) data are now being released on a flow basis into 2015. This section profiles one industry — for U.S. household appliance manufacturing (NAICS 3352) — what economic census data are available, what related data are available, how to access the data and issues concerning use. These same topics may be applied to any type of business/industry category. How is this industry trending? How might these changes impact your business, marketshref=: or regional economy? See related HTML section. In July 2014, the release of the 2012 Economic Census household appliance manufacturing data showed that the value of shipments for the nation’s 95 household cooking appliance manufacturing establishments totaled $4.3 billion in 2012, down 10.8 percent from $4.9 billion in 2007. A typical EC industry attribute narrative, for the household cooking appliance manufacturing industry, is as follows. The household cooking appliance manufacturing industry employed 10,324 people in 2012, down 34.0 percent from 15,638 in 2007. 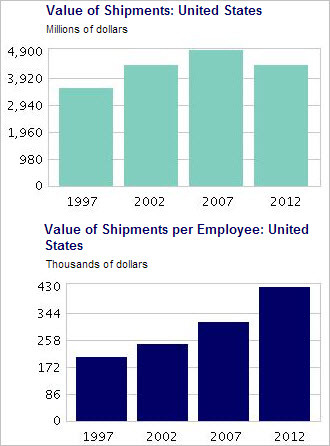 Average payroll per employee increased 23.0 percent from $30,199 in 2007 to $37,143 in 2012. The average number of employees per establishment in this industry decreased 20.1 percent, from 136 in 2007 to 109 in 2012. 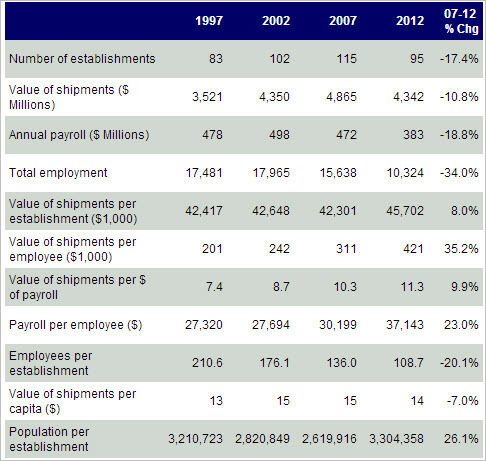 The household appliance manufacturing industries are shown in the table below by NAICS code. Selected resources are reviewed below which may be used to access/develop industry data by detailed NAICS levels. 1. Use the economic census report portal to view industry characteristics. Click this link to access similar data for an industry. 2. 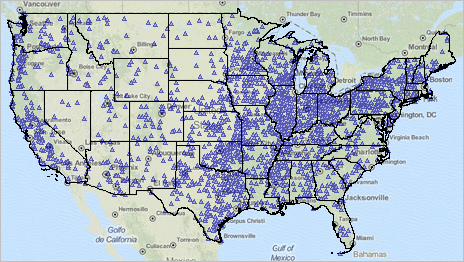 Access different types of Census-sourced data available for industry 335221. The Industry Statistics Portal allows a user to select a single NAICS code and the tool returns a list of all of the Census statistical programs that provide data for that industry. The tool provides a nice definition of the industry as well as information about comparability of the industry over the various vintages of NAICS. To use this tool, go to the Topics menu on census.gov, place your cursor over the word “Economy” and then select the Industry Statistics Portal from the list. You can then choose the industry of interest by either selecting it from the menu/tree on the left or from the search box on the right. 3. Access establishments, employment & wages BLS/CEW data for industry 335221. The BLS Census of Employment and Wages provides quarterly establishments, employment and wages data based on employer reports. These quarterly and annual time-series data are available down to the county level of geography. These data provide the most recent industry characteristics. The following table shows these data for 2012 and 2013. While no demographic-economic data are tabulated from the American Community Survey (ACS) at the NAICS 6-digit level, employment data by 1- and 2-digit NAICS level are available by census tract, county and other geography. Develop annual custom estimates of the employed population, and their attributes and household attributes by using the ACS Public Use Microdata Samples (PUMS) files. Develop these estimates for Public Use Microdata Areas (PUMA). PUMAs are groups of contiguus census tracts and have a minimum population of 100,000. 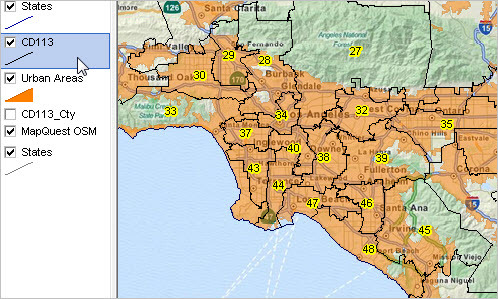 For example, Los Angeles County, CA is comprised of 69 PUMAs. The ProximityOne 5-year annual projections (DE6 series) use the BLS/CEW data (item 3 above) in combination with other data to develop projections at the county level and for higher level geography. While these data are focused on 1- and 2-digit data, the model can be adapted to develop projections for other, more detailed, industries. The Bureau of Economic Analysis Regional Input-Output Modeling System (RIMS) produces regional multipliers that can be used in economic impact studies to estimate the total economic impact of a project on a region. RIMS includes more than 400 industry sectors. Among these industries, for example, are household appliance manufacturing (NAICS 3352) and associated 6-digit more detailed industries (see list in above table). Learn more about using resources described in this section. Join us in a Decision-Making Information Web session. There is no fee for these one-hour Web sessions. Each informal session is focused on a specific topic. The open structure also provides for Q&A and discussion of application issues of interest to participants. We can address your specific questions about using industry data and related applications. As the population ages, migrates and otherwise changes, healthcare needs change by location, type and in other ways. Current small area demographics of these demand measures are not readily available — when knowing about changes in demand over the next several years is even more important. Changing economic circumstances and issues with insurance coverage affect the ability to pay and the demand for various healthcare resources. This section provides an overview of the healthcare analytics focused on California. Resources and applications reviewed here can be emulated for other states and regions. The purpose of this section is to illustrate how a set of diverse, multi-sourced, healthcare supply and demand attributes can be organized for visual and geospatial analysis. See more details in related Web section. • Relating Medically Underserved Areas (about MUAs/MUPs) to neighborhoods by economic prosperity. • Relating locations of healthcare facilities (hospitals, clinics) to MUAs? • Relating MUAs relate to Health Professional Shortage Areas (about HPSAs). • Determining neighborhoods with highest need for healthcare services. Get answers to these types of questions using multiple layers in a GIS project. 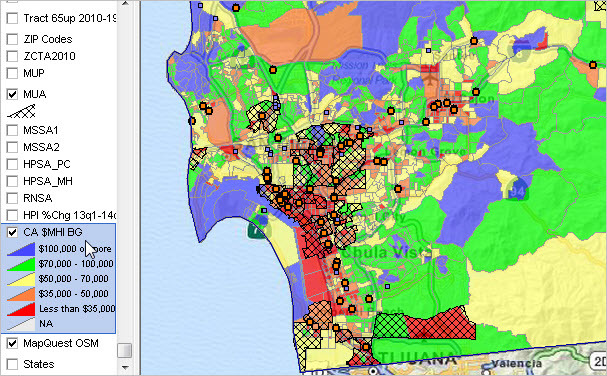 The following view of the San Diego area and shows a mix of healthcare related demographic-economic characteristics. The cross-hatched pattern areas have been designated as Medically Underserved Areas (MUAs). Patterns of economic prosperity (median household income by block group) are shown by color patterns as highlighted in the legend at left of map view. It is easy to see where the MUAs are located. Many MUAs are located in areas with medium to higher economic prosperity. 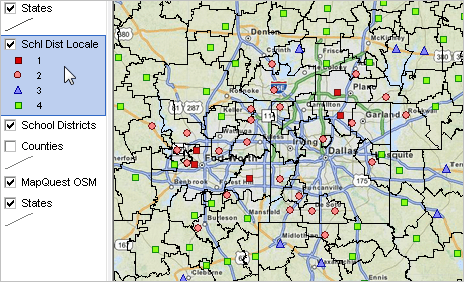 Locations of primary care facilities, shown by square markers, can be viewed contextually. View developed using CV XE GIS and California DMI GIS Project. 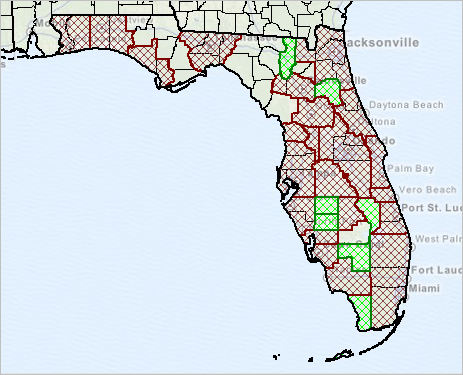 Using GIS resources, the map views can be displayed in different ways to accomodate the needs of geographic and/or subject matter focus. Zoom-in or out for a broader or more focused view. Label features of interest (e.g., hospital names). Click layers on or off (in legend panel at left of map panel) to view geographies or locations of specific interest. Add other data such as geocoded patient or incident data. Additional views shown below, from the same GIS project, illustrate some of these application views. 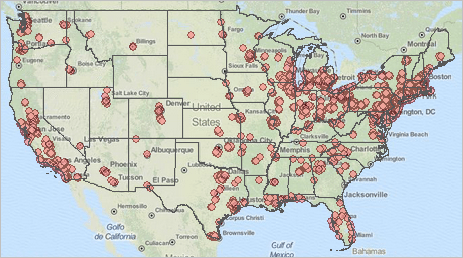 Map views are just one part of the GIS resource benefits. Query tools can be used to highlight only locations of geographies that meet certain criteria, such as hospital bed capacity. GIS tools and selected demographic-economic shapefiles shown above are available at no fee to ProximityOne User Group members. Join now, there is no fee. Add your data. Examine different geographies. Extend healthcare analytical and collaborative decision-making. This section reviews tools and methods to examine school districts classified as urban, suburban or rural. School districts are categorized by a “locale code” that gives insights into the urban, suburban or rural character of individual school districts. Map views presented here have been developed using a GIS project that may be downloaded and used to analyze more detailed characteristics of districts by these categories. The locale code, a 2-digit code assigned to each district, can be used to categorize school districts into one of four major categories: city, suburban, town, and rural. Cities and suburbs are further divided into categories of small, mid-size, or large. Towns and rural areas can be characterized by their proximity to an urbanized area as fringe, distant, or remote. These are codes are developed by the U.S. Department of Education National Center for Education Statistics (NCES). NCES assigns the codes to individual school districts. See more about locale code definitions. Use this interactive table to view the locale code for any particular district and examine sets of peer districts based on the locale code and related demographics. The locale code is an imperfect means of classifying school districts as urban, suburban or rural but offers one important standardized method. Many larger school districts, particularly those that are county-equivalents, are a mix of urban, suburban and rural geography. The maps presented below show the distribution of regular school districts as markers by type of locale code. These maps depict school district locations based on use of a point shapefile. The point shapefile shows the marker location based on the school district mailing address. These views render each school district as the same size (a point) regardless of geographic area covered. These views have been developed using the CV XE GIS software and associated GIS project. Members of the ProximityOne User Group (join now, no fee) may install the no fee software and GIS project. Develop custom zoom-in views, label school districts, perform queries, add your own data, add related geographic layers and perform other types of geospatial operations. • Shows all 4 types of locale codes as markers. 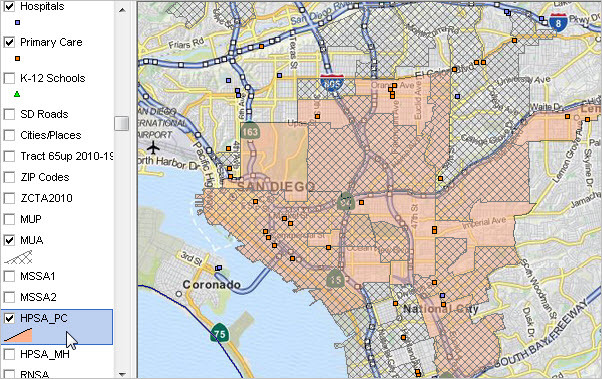 • A school district polygon layer shows boundaries for corresponding locale type markers. 4. Done. The start-up view appears similar to map graphics above. City, Large Territory 11 … inside an urbanized area and inside a principal city with population of 250,000 or more.City, Mid-size Territory 12 … inside an urbanized area and inside a principal city with a population less than 250,000 and greater than or equal to 100,000. City, Small Territory 13 … inside an urbanized area and inside a principal city with a population less than 100,000. Suburb, Large Territory 21 … outside a principal city and inside an urbanized area with population of 250,000 or more. Suburb, Mid-size Territory 22 … outside a principal city and inside an urbanized area with a population less than 250,000 and greater than or equal to 100,000. Suburb, Small Territory 23 … outside a principal city and inside an urbanized area with a population less than 100,000. Town, Fringe Territory 31 … inside an urban cluster that is less than or equal to 10 miles from an urbanized area. Town, Distant Territory 32 … inside an urban cluster that is more than 10 miles and less than or equal to 35 miles from an urbanized area. Town, Remote Territory 33 … inside an urban cluster that is more than 35 miles from an urbanized area. Rural, Fringe 41 … Census-defined rural territory that is less than or equal to 5 miles from an urbanized area, as well as rural territory that is less than or equal to 2.5 miles from an urban cluster. Rural, Distant 42 … Census-defined rural territory that is more than 5 miles but less than or equal to 25 miles from an urbanized area, as well as rural territory that is more than 2.5 miles but less than or equal to 10 miles from an urban cluster. Rural, Remote 43 … Census-defined rural territory that is more than 25 miles from an urbanized area and is also more than 10 miles from an urban cluster. Learn more about using resources described in this section. Join us in a Decision-Making Information Web session. There is no fee for these one-hour Web sessions. Each informal session is focused on a specific topic. The open structure also provides for Q&A and discussion of application issues of interest to participants. We can address your specific questions about using school and school district demographic economic data and related applications. 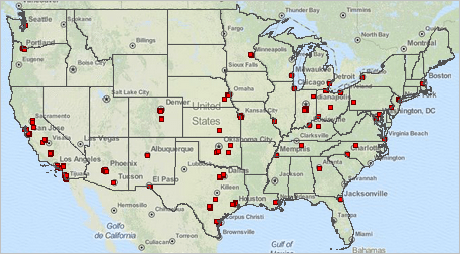 The 929 U.S. metropolitan areas are comprised of one or more counties, some with up to 30 counties. More than 93-percent of the total U.S. population live in metropolitan areas. Creating metro maps is often specific to a particular analysis, zoom-view, labeling, combination of different geographies or other considerations. This section reviews tools that you can use to flexibly develop your own maps that show U.S. metropolitan areas of interest using Geographic Information System (GIS) tools. The GIS resources enable you to view/show the metro boundaries in context with roads, landmarks and other geography. Flexibly add labels. Create pattern views. Add your own data. Metro maps can be saved as a graphic and used in any manner. There are no fees to use resources described in this section. See the related Web section for more detail on this topic. Metro mapping makes use of the latest vintage metro definitions (February 2013) and latest smoothed boundary shapefiles (July 2014). See more about the metro shapefile. There are three metro GIS project files included with the ZIP file. Each GIS project (*.gis) includes the same set of layers/shapefiles. Only attributes of layers set by the CV XE GIS Layer Editor differ. See about modifying layer settings with Layer Editor in the related Web section on this topic. When the c:\metromaps\metromaps1.gis is opened, the view shown below appears. 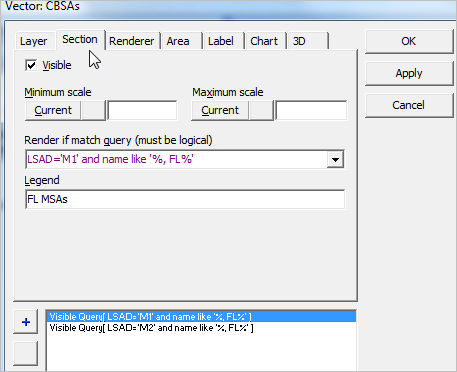 This project illustrates how the CBSA layer query can be set to view a specific metro of interest. See the Layer Editor settings used for this view. When the c:\metromaps\metromaps2.gis is opened, the view shown below appears. This project illustrates how the CBSA layer query can be set to view all MSAs and/or MISAs on a national/regional scale. See the Layer Editor settingsused for this view. When the c:\metromaps\metromaps3.gis is opened, the view shown below appears. 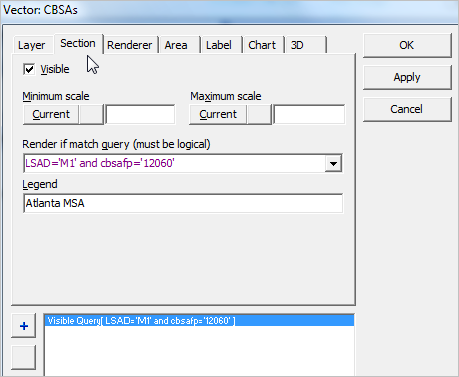 This project illustrates how to apply a CBSA layer query to view all MSAs and/or MISAs in a selected state. See the Layer Editor settings used for this view.